This article is about the species of plant usually known as hyssop. For other species in the same genus, sometimes called hyssop, see Hyssopus (plant). For the plant in the Hebrew Bible usually called hyssop, see Ezov. Hyssopus officinalis or hyssop is a(n) herbaceous plant of the genus Hyssopus native to Southern Europe, the Middle East, and the region surrounding the Caspian Sea. Due to its properties as an antiseptic, cough reliever, and expectorant, it is commonly used as a medicinal plant. A plant called hyssop has been in use since classical antiquity. Its name is a direct adaptation from the Greek ὕσσωπος (hyssopos). The Hebrew word אזוב (ezov, esov, or esob) and the Greek word ὕσσωπος probably share a common (but unknown) origin. The name hyssop appears as a translation of ezov in some translations of the Bible, notably in verse 7 of Psalm 51: "Thou shalt purge me with hyssop, and I shall be clean" (King James Bible), but researchers have suggested that the Biblical accounts refer not to the plant currently known as hyssop but rather to one of a number of different herbs, including Origanum syriacum (Syrian oregano, commonly referred to as "bible hyssop"). I Kings iv. 33 mentions that 'ezov' was a small plant. It was burned with the Red Heifer (Num. xix. 6) and used for purification of lepers (Lev. xiv. 4, 6, 49, 51; comp. Num. xix. 18; Ps. li. 9), and at Passover it was used to sprinkle the blood of the sacrificial lamb on the doorposts(Ex. xii. 22). Hyssop was also used for purgation (religious purification) in Egypt, where, according to Chaeremon the Stoic, the priests used to eat it with bread in order to purify this type of food and make it suitable for their austere diet. 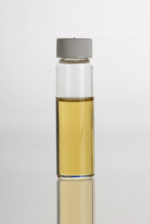 The essential oil includes the chemicals thujone and phenol, which give it antiseptic properties. Its high concentrations of thujone and chemicals that stimulate the central nervous system, including pinocamphone and cineole, can provoke epileptic reactions. The oil of hyssop can cause seizures and even low doses (2–3 drops) can cause convulsions in children. In herbal medicine hyssop is believed to have soothing, expectorant, and cough suppressant properties. Hyssop can stimulate the gastrointestinal system. ↑ "The Plant List: A Working List of All Plant Species". Retrieved 13 January 2015. ↑ Pérez Maté, P. (2002). 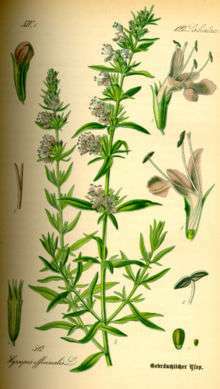 Especies aromáticas y medicinales (in Spanish). Buenos Aires: INTA. .
↑ Fleisher, A.; Fleisher, Z. (1988). "Identification of biblical hyssop and origin of the traditional use of oregano-group herbs in the Mediterranean region". Economic Botany. 42 (2): 232–241. doi:10.1007/bf02858924. ↑ R.K. Harrison (1954). "The Biblical Problem of Hyssop" (PDF). The Evangelical Quarterly. 26 (4): 218–224. ↑ "HYSSOP - JewishEncyclopedia.com". www.jewishencyclopedia.com. Retrieved 2016-05-28. ↑ From Chaeremon's History of Egypt, as quoted by Porphyry, De Abstinentia IV.6.9. ↑ van Wyk, Ben-Erik; Wink, Michael (2004). Medicinal Plants of the World (1 ed.). Timber Press, Incorporated. ISBN 978-0-88192-602-6. , p 177. ↑ Pierre R. Burkhard; Karim Burkhardt; Charles-Antoine Haenggeli; Theodor Landis (1999). "Plant-induced seizures: reappearance of an old problem". J Neurol. 246: 667–670. PMID 10460442. ↑ Grieve, M. "Hyssop: A Modern Herbal". Botanical.com. ↑ Crellin, John; Philpott, Jane (1997). A Reference Guide to Medicinal Plants: Herbal Medicine Past and Present. Duke University Press. ISBN 978-0-8223-1019-8.